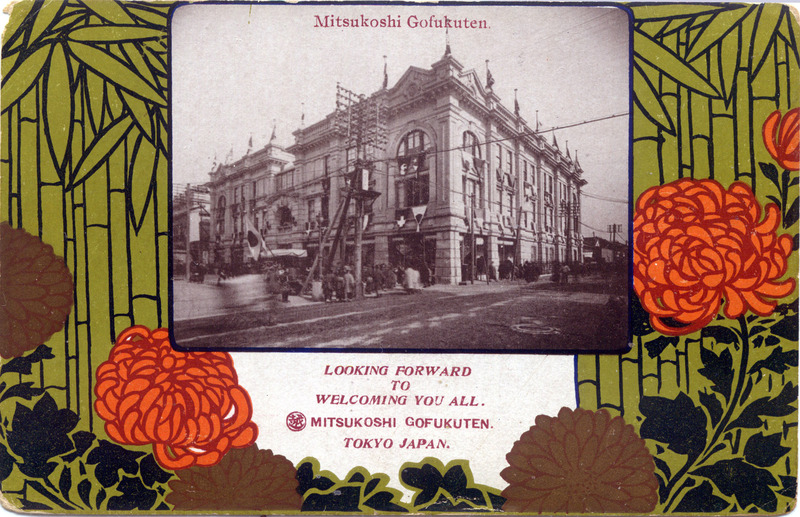 Mitsukoshi Gofukuten advertising postcard for the first Western-style department store that replaced Echigoya in 1903. Postcard was printed to commemorate the arrival of the US naval squadron, the “Great White Fleet“, to Japan in 1908. 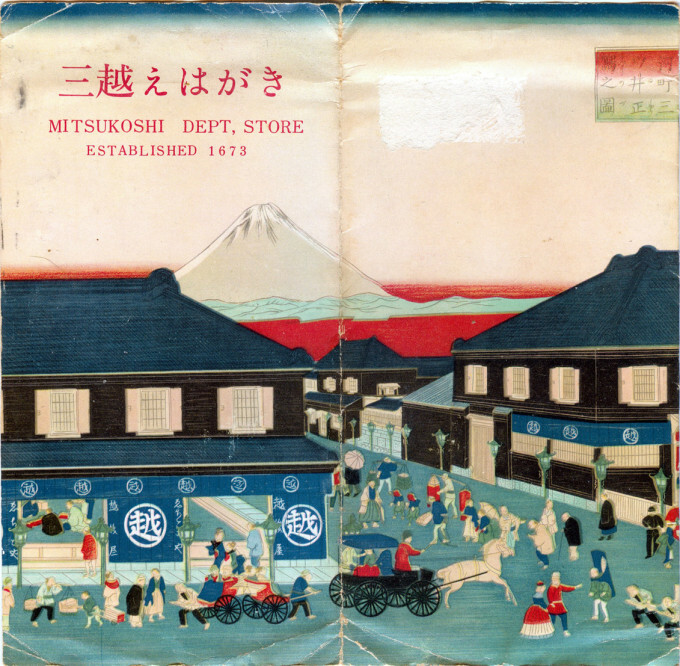 Advertising brochure c. 1960 cover depicting the Edo-era Mitsukoshi department store (neé Echigoya) and distant Mt. Fuji. For the better part of 75 years, in the 20th century, the flagship Mitsukoshi store at Nihonbashi dominated Tokyo’s retail trade, just as its predecessor, Echigoya, had dominated, and had revolutionized, the sale of dry goods during the Edo Era: Instead of vending door-to-door or accepting commissioned work, as was the 17th-century custom, founder Mitsui Takatoshi opened a storefront to draw-in customers paying fixed prices in cash for kimono, textiles and draperies. Mitsukoshi was registered as the store’s legal name (from Echigoya) on 15 Oct 1904. 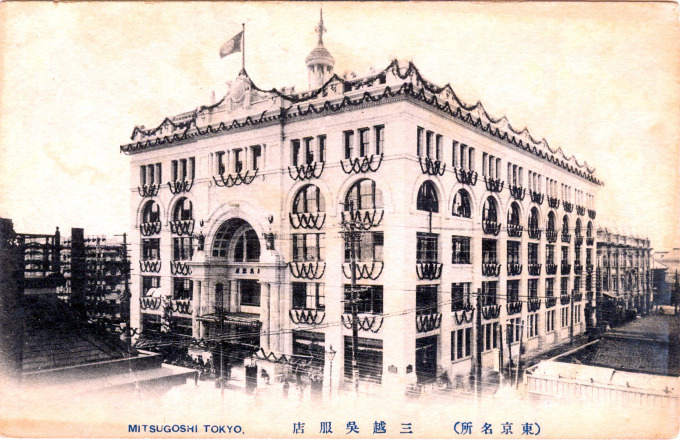 The original three-story Mitsukoshi (seen in the image above), opened in 1903, featuring exterior windows to display products and store image to pedestrians, replacing the traditional noren curtains, and the use of mannequins for wardrobe displays. The original store would soon be replaced by a much larger building in 1914. “Architecturally and artistically the new home of Mitsukoshi has won the admiration not only of the Japanese public but of visitors from all over the world. “The ‘White Building of Art and Commerce’ occupies one of the finest corner sites near the world – renowned Nihonbashi – with a frontage of 120 feet on Muromachi and a depth of 180 feet on Surugacho, five floors of merchandise, a most spacious basement, and a very interesting roof garden. This magnificent edifice is constructed with an iron and steel frame of white concrete absolutely fire and earthquake proof, and is of pure Renaissance style. 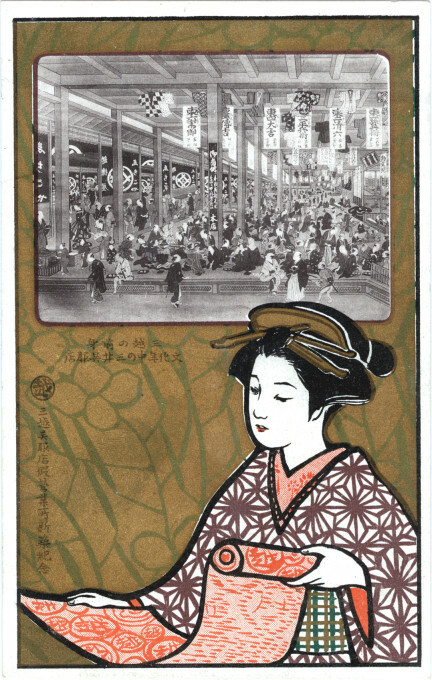 Mitsukoshi department store advertising postcard, c. 1910, depicting the interior display of wares of Echigoya during the Edo era. At its opening, the centrally-heated colossus was said to be the largest building — determined by total volume — east of the Suez. It also boasted such new technologies as escalators and elevators. It also included large spaces for arts-related exhibitions and performances. These included exhibitions of paintings, crafts, flower arrangements, photography and sundry items related to the improvement of daily life. 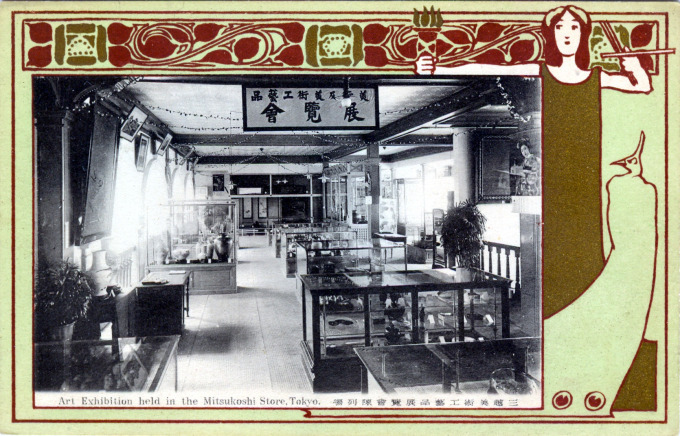 Times were prosperous: Mitsukoshi employed 323 in 1905, and 892 by 1908. 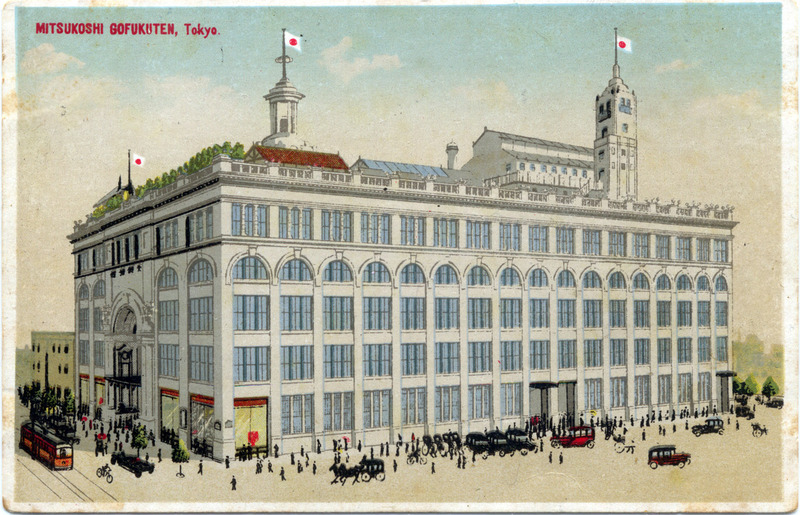 By 1915, the number of Mitsukoshi employees had risen to 2,245; 8,700 by 1935. 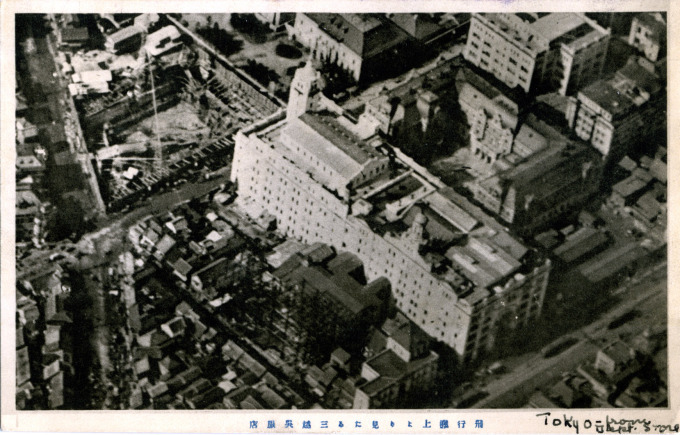 The second Mitsukoshi store was destroyed in the 1923 Great Kanto earthquake. Its replacement, at the same location, would be completed and open in 1926. During the interim, Mitsukoshi would open a branch store in 1925 at Shinjuku, a district that was largely untouched by the earthquake. 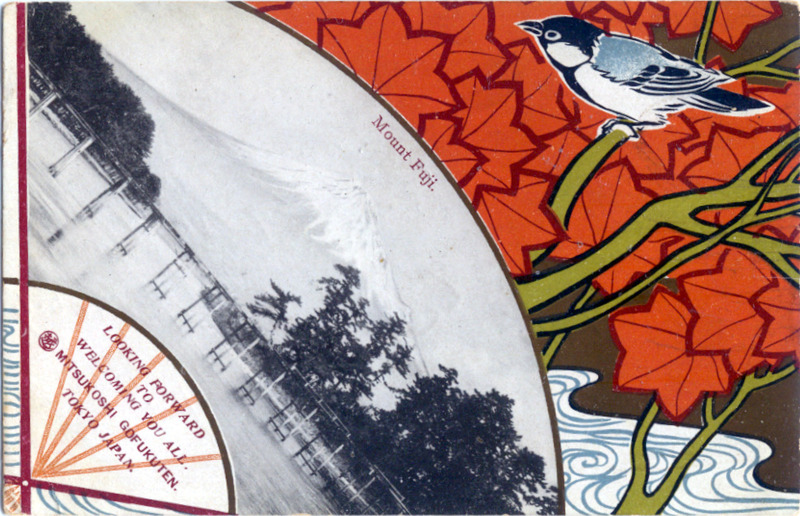 Mitsukoshi department store, advertising postcard, c. 1908, welcoming the ‘Great White Fleet’ to Japan. 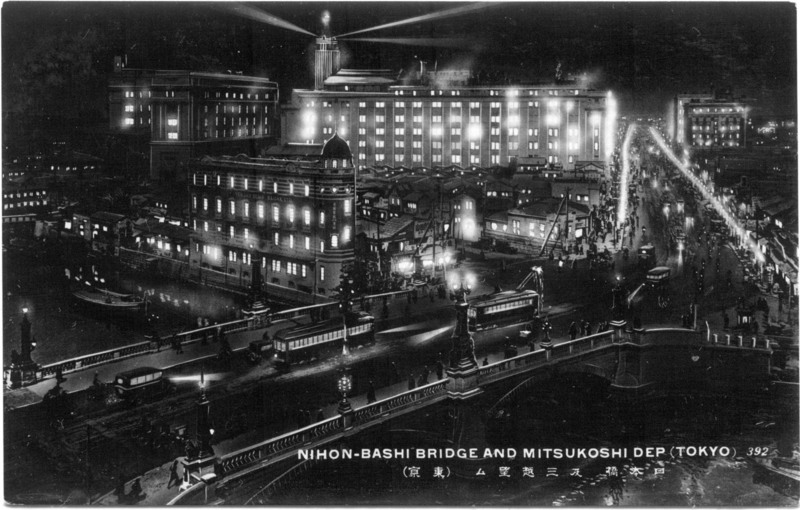 Mitsukoshi, c. 1914. Decked out for its grand re-opening. 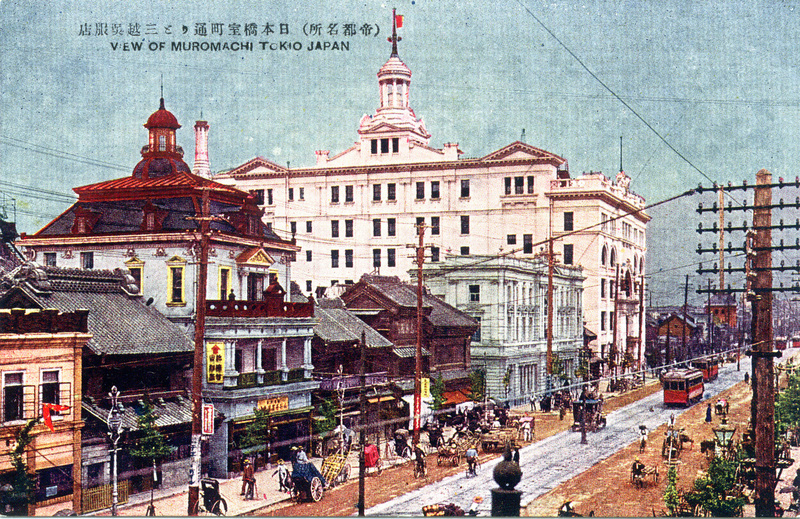 Mitsukoshi, c. 1914, with the Murai Bank in the foreground. 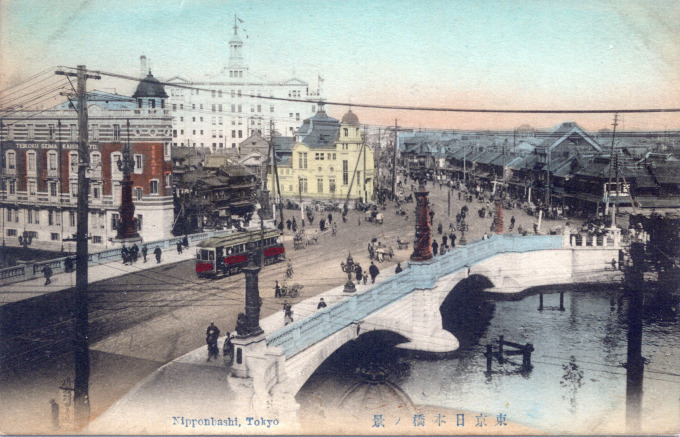 Nihonbashi, looking north, and the Imperial Hemp building (left) and Mitsukoshi department store (with the tower) in the distance, c. 1920. Art Exhibition held in the Mitsukoshi Store, c. 1905. 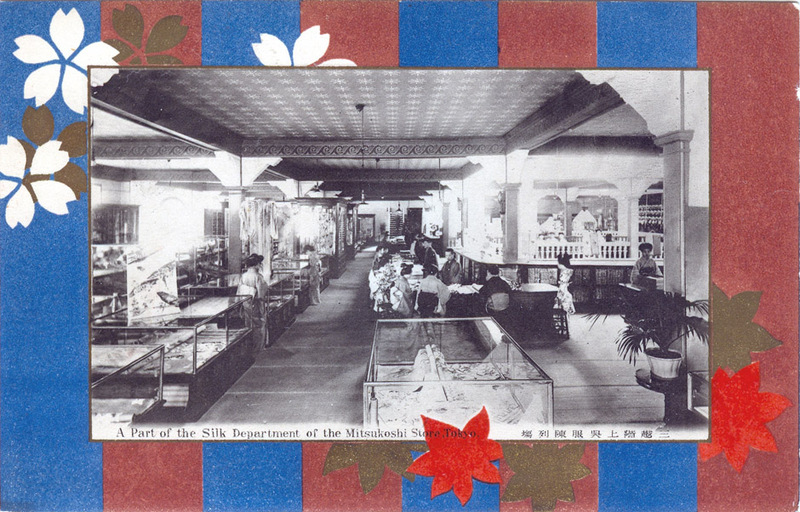 Mitsukoshi department store, silk department, c. 1910. “Yesterday we were taken by Mr. and Mrs. Y.K. to the mamamoth department store called the Mitsukoshi – a name which in Japan sounds like Wanamaker’s to a New Yorker or T. Eaton to a Canadian. There was a vast crowd outside – all patiently waiting to be admitted … Finally we reached the main entrance and were greeted by many servants with wiping cloths and large slippers, for no one is allowed in the building save with clean feet and such soles as may not scratch the dainty ﬂoors. “… The crowd on the day of our visit was largely of the farmer class; for just now is their slack time when a trip to the big city can be made with least inconvenience. Elevators were going up and down, each crowded with children and parents – many of them having their ﬁrst experience of this new form of excitement. There were waiting rooms and retiring rooms and rolling staircases and many wax work models and above all a vast restaurant that was generously patronized. the mob than the aristocracy … Imagine Macy’s or Gimbel’s in New York providing men to carefully wipe each customer’s shoes and afterwards encase them in large protective slippers! And can you imagine such a crowd respecting the privacy of a family group seated in a circle on the ﬂoor and sedately partaking of their domestically prepared luncheon! Mitsukoshi department store, c. 1920. 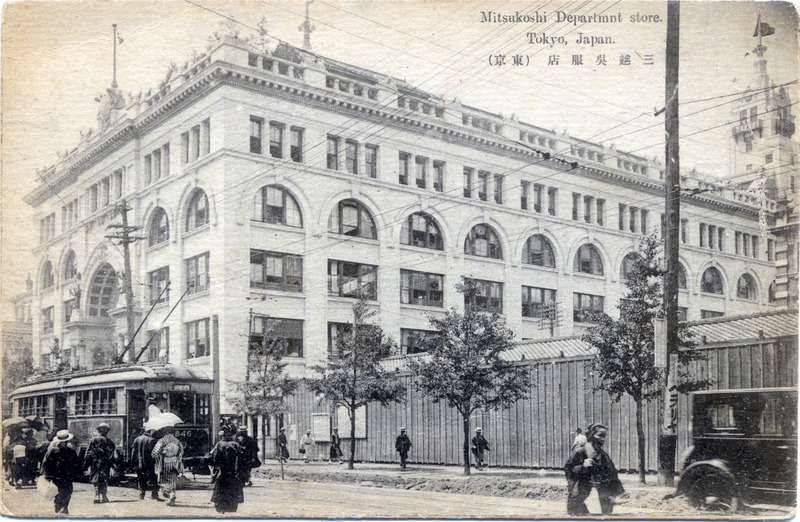 Mitsukoshi department store (with towers) and the u-shaped Mitsui Bank, c. 1920. Night view, Mitsukoshi department store & Imperial Hemp building, Nihonbashi, c. 1920.